Back to life…back to cooking! Whew! The show has closed and it was a success. Thankfully. Now it’s back to work. Tonight I put fresh broccoli into the freezer and cooked a delicious one dish dinner – stuffed zucchini! I had two semi-large zucchini from the farmer’s market as well as some onions, bell peppers, garlic, sweet Italian sausage, and fresh Parmesan cheese. Mads had a soccer match, so I needed something easy and fairly quick. Therefore I put EVERY heat implement I had to the test. I preheat my oven to 350 degrees F. I cut the tops off the zucchini, washed them well, halved them, and then put them in a microwave dish with a glass lid and nuked for 7 to 8 minutes until they were tender. While they were going, I diced onion and garlic, and grabbed some frozen bell pepper strips from my stash in the freezer and put them in a cast iron skillet along with a bit of olive oil. I let them begin to sweat a bit while I removed 4 links of sweet Italian sausage from their casings. I popped the sausage into the skillet and let it all start to brown, adding some cracked black pepper, and a healthy couple tablespoons of Italian seasoning. The zucchini was then tender and I used a spoon to scoop out the centers of the squash, leaving a shell with about 1/4 of an inch of zucchini in it. I added the scooped out centers to the pan, letting it all cook thoroughly until fairly dry. I put the zucchini boats face down on a kitchen towel, letting the extra liquid drain out of them. I used the same baking dish from the microwave, drying it out thoroughly, and then I brushed a bit of olive oil on the skin of the drained zucchini shells before returning them, face up, to the dish. 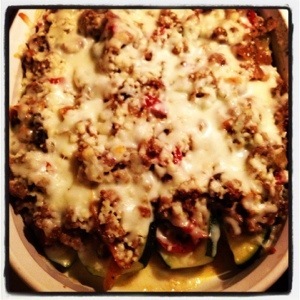 Using a slotted spoon, I then scooped the sausage and veggie mixture into the zucchini boats. I sprinkled each with the Parmesan cheese, and then realized there wasn’t NEARLY enough melty goodness going on there so I added some shredded mozzarella. The dish went into the oven while I washed up the dishes I had used… (Try not to faint!) and had Mads make some iced tea. Fifteen minutes later, I had warm, savory stuffed zucchini shells, topped with melted cheese. The secret here is to make sure the meat mixture is highly seasoned. The squash has a very mild flavor, and the mixture ends up being perfectly flavorful, not too spicy and not too bland. Best yet it was quick! Thirty minutes from start to eating… and it was a great antidote to today’s weather which turned out to be wet and chilly. PLUS, those leftovers are going to be super delicious for lunch tomorrow. It is SO good to be home!